On Monday, the United States Merchant Marine Academy learned that a beloved and much admired, long-time member of our USMMA family, former Athletic Director Susan "Sue" Petersen Lubow, has passed away. Kings Point, NY - October 6th, 2015 - On Monday, the United States Merchant Marine Academy learned that a beloved and much admired, long-time member of our USMMA family, former Athletic Director Susan "Sue" Petersen Lubow, has passed away. Petersen Lubow, who started her Kings Point career 36 years ago as a physical education instructor, quickly rose through the ranks and earned an appointment as Athletic Director in 1989. This groundbreaking move marked the first time that a female held that position at any of the United States Federal Service Academies. In March 2014, after a very successful 25 years at the helm of the department, she announced that she was stepping down from her position as the Academy’s Head of Physical Education and Athletics, but would remain on staff as a fully tenured professor. Petersen Lubow was one of the most accomplished administrators in the history of the Academy. Her contributions are immeasurable. In the 25 years she served as Athletic Director, she expanded USMMA Athletics to over 20 teams and helped develop the Blue and Gray Club, Athletic Hall of Fame, Blue and Gray Golf Classics and other numerous traditions and awards. As an administrator, Petersen Lubow served on a number of committees in the Eastern Collegiate Athletic Conference (ECAC), a regional conference comprised of 320 Division I, II, and III institutions. Petersen Lubow was appointed as an Executive Board member, the Chair of the Marketing Committee, the Chair of the Swimming and Diving Committee, the Chair of the Finance Committee, and the Chairperson of the ECAC Division III Football Committee, a position also never before held by a woman. Petersen Lubow began working at the Academy in 1979, when she was appointed the head coach position for the both the men’s and women’s swimming & diving teams, making her at the time the first female to be the head coach of a varsity men's team at any service academy. During her time at the helm of the men’s and women’s swimming & diving teams, the two programs combined for a 148-67 record over 11 years. Petersen Lubow coached 48 All-America male and female swimmers and divers, including both a men's and women's NCAA Division III Individual National Champion. Throughout her coaching and administrative career in swimming & diving, Petersen Lubow had been very involved with both USA Swimming and NCAA Swimming & Diving. She served as the Secretary and Rules Editor for the NCAA Division I, II and III Swimming and Diving Committee. Petersen Lubow also acted as the Head Manager for the 1998 World Swimming Championships, travelling with the USA National Team to Perth, Australia in January, 1998. In October 2004, she was tapped as the head manager for the USA Short Course World Swim Team that hosted the World Championships for the first time in history. Petersen Lubow devoted the summers of 1993-95 to the USA National Swim program, serving as Head and Assistant Manager. 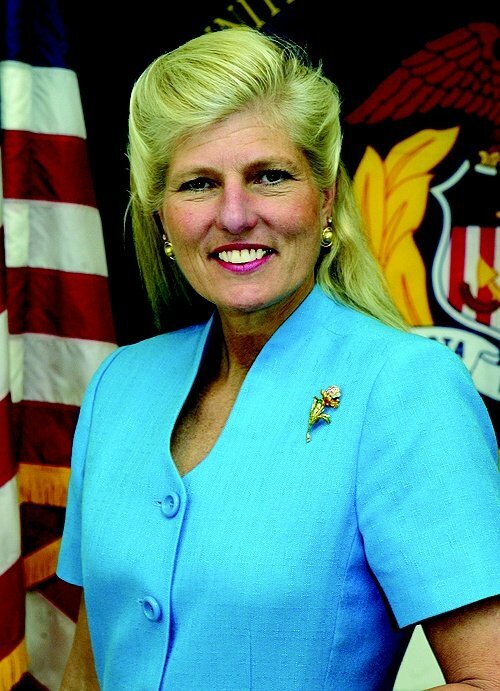 Petersen Lubow, an honorary alumna of the USMMA Alumni Association and Foundation, graduated from Springfield College in 1975. She went on to earn her Master's Degree in Health Education from Hofstra University in 1979. Prior to coaching, Petersen Lubow was a national competitor in AAU age group swimming. She was also an All-American in the 200 individual medley as well as the medley relay (1971-72) at Springfield College, where she also served as the team captain. Petersen Lubow was inducted into Springfield College's Athletic Hall of Fame in 1991 and the New York Metropolitan Swimming Hall of Fame in 2009. She was a two-time New York Open Champion and in 1972 was an Olympic qualifier for trials. For her contributions to the Academy and Intercollegiate Athletics in general, Petersen Lubow was inducted into the USMMA Athletics Hall of Fame in 2014 and then also the ECAC Hall of Fame (as part of its inaugural class) earlier this year. She is also a member of the Metropolitan Swimming Hall of Fame, having been inducted in 2009. Petersen Lubow will be remembered for cheering loudly for her team, and her contagious enthusiasm, strength and determination inspired thousands over the years. She was an exemplary athlete, a motivating coach, an outstanding leader, and a young athlete’s biggest fan - especially to her daughter, Sarah. A funeral service for Sue Petersen Lubow will be held at the Mariners’ Memorial Chapel on the campus of the United States Merchant Marine Academy next Tuesday, Oct. 13, at 11 a.m. More information on the service will be provided close to the date. Subject: LongIsland.com - Your Name sent you Article details of "USMMA Mourns The Passing Of Former Athletic Director Sue Petersen Lubow"